An animal’s head would be a strange, if not eccentric, gift for most people. But for Chicago-based artist Lana Crooks, the wild pig skull her mother recently gave her is a treasured muse for a future work of art. Crooks uses her anatomical infatuation to create delicate skull sculptures made from fabric. Her own body – and its inherited imperfections – sparked the idea. She was born with skeletal dysplasia with stomatognathic dysfunction, a rare genetic disorder that produces bone abnormalities. “That’s ‘surgeon-speak’ for ‘your face doesn’t fit together properly,'" she said. Crooks' sculptures appear so lifelike that one might think they were dug out of a museum, dusted off and promptly put on display. There is some truth to that notion: Crooks regularly visits the Peggy Notebaert Nature Musuem to study animal bone specimens. 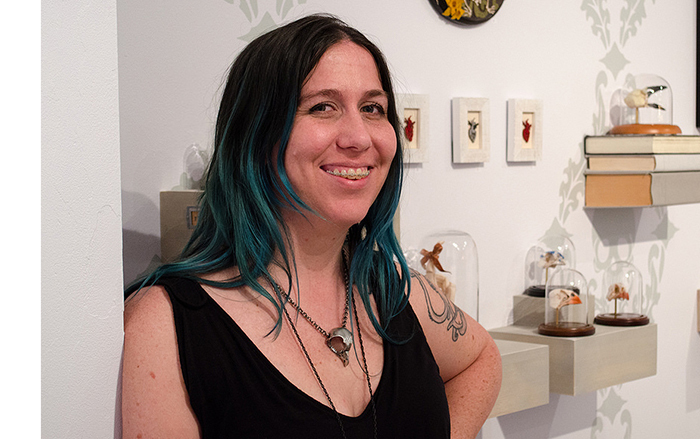 After spending hours sketching animal bones, Crooks returns to her studio where she scans her drawings into a computer. From there, she tweaks and duplicates the illustrations before printing them out. Crooks then traces her outlines onto fabric. The shapes are cut out of wool or silk, dyed overnight and then manipulated to resemble their respective bones. The pieces are joined using fabric glue or a good old fashioned needle and thread. The intricate and delicately formed skeletal sculptures are usually mounted and put under glass domes. She works hard to make her sculptures look as anatomically accurate as possible. This requires a steady hand, a keen eye for detail and, unsurprisingly, a great deal of patience since Crooks’ process is one of trial and error. Her most popular pieces are finch skulls, which she normally makes in batches of five. This July, however, she unveiled her most ambitious undertaking to date: a human skull. "Memento Mori" is a full-scale skull modeled after “Larry” – a human skull originally donated for medical study that Crooks purchased at an artist’s yard sale. The wool sculpture was made for a ghost-themed exhibit called “Mourning Apparitions” that ran at the Stranger Factory art gallery in Albuquerque, New Mexico. Prior to sculpting skeletal remains, Crooks was a costume designer for stage and screen who dabbled in making designer toys: plush, one-of-a-kind collectibles. Since moving to Chicago just over a decade ago, these two endeavors helped pay her bills and heighten her textile skills. But around 2008, Crooks began to heed the call from the natural world, one which she’s heard for most of her life. This summer Crooks had the surgery required to fix her shifting bones and teeth. It’s an operation she was supposed to have in junior high school, but since patients must wear braces for over a year prior to surgery, the image-conscious teen was unwilling to wear a fresh set of braces so soon after having a former set removed. The operation, a two-piece lefort with bilateral sagittal split and osteotomy advancement (what Crooks casually refers to as a “face-off"), was needed to fix her lower jaw, which pushed on her airway and made breathing difficult. In fact, her teeth only met in one place: the back left row of molars. This arrangement made eating an interesting affair: Crooks likened her technique to that of an alligator tearing food apart. After wearing braces for 16 months as an adult, an experience Crooks described as mildly mortifying, she went under the knife in July. The surgery sounds drastic: her palate was disassembled and rearranged while the upper jaw was slightly relocated. Her lower jaw was broken and elongated with a metal “sliding door” implant and everything was fastened into place with metal screws that Crooks will carry in her mouth for life. Unsurprisingly, the expected recovery time for essentially having your face broken and rearranged is daunting: six to nine months and potentially years of residual numbness. But it wouldn’t take long for art to imitate life. While she’s under her husband’s health insurance, there are plenty of uncovered medical costs that Crooks must pay herself. To help tackle those expenses, she’s been selling tooth-themed artwork as part of a project called “A Tooth for a Tooth.” The most popular of these works are her glass-encased, hand-sewn wool molar sculptures, which sold out quickly after debuting in September. Crooks plans to make more molars available online soon. Non-human teeth are set to make an appearance in her catalog, too. Crooks recently acquired some bison and bear specimens that she’ll use for upcoming works in “Bear in Mind,” a group exhibit running from May 14-June 3, 2016 at Clutter Gallery in Beacon, New York. December marks her fifth month of post-surgery recovery. As she regains more energy and feeling in her jaw, it shouldn’t be long before the artist is back to sifting through bones at local science museums.